While my cousin Hannah was visiting last month, we tried out a few new restaurants. One of the meals we enjoyed most involved waffles with a buttermilk syrup. I have a weakness for a great homemade syrup, as evidenced by my grandmother’s Waffle Sauce and this Brown Sugar Syrup. However, I’d never tasted a buttermilk syrup before that day. As soon as we were home, I told Hannah we needed to recreate that amazing Buttermilk Syrup. 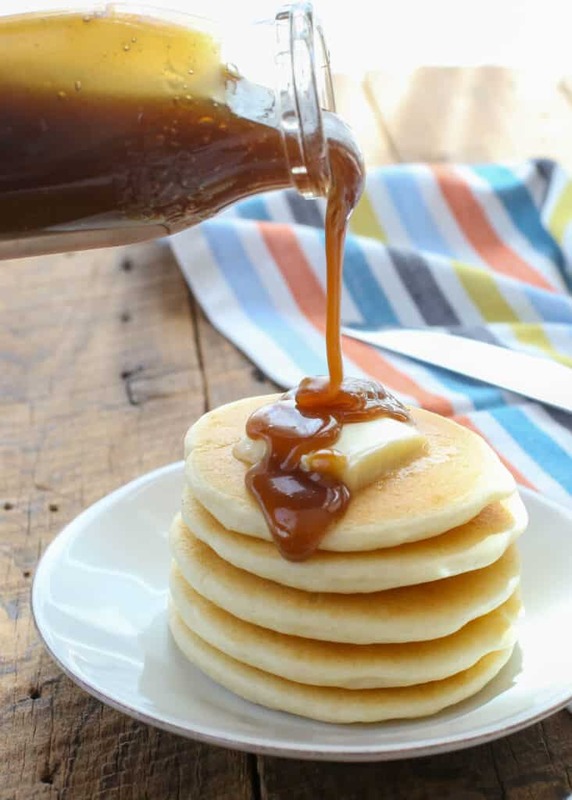 This buttermilk syrup is slightly creamy, rich with brown sugar, buttermilk, and butter, and somewhat reminiscent of caramel sauce. However, it isn’t nearly as sweet as a traditional caramel sauce. In the past two months, I’ve probably made this buttermilk syrup at least six times. As you know, I’m a breakfast all day long kind of person and I have an enormous weakness for waffles, pancakes, and pretty much every other breakfast we can make. 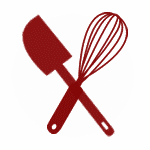 The baking soda in this recipe works to balance the acid in the buttermilk. I started with this recipe and have tweaked it to come up with this version that we truly love. I’ve made this with plain milk and it isn’t quite the same. And we didn’t love it as much with white sugar either. The buttermilk without the baking soda results in a slightly tangy syrup that isn’t exactly what I was trying to create. 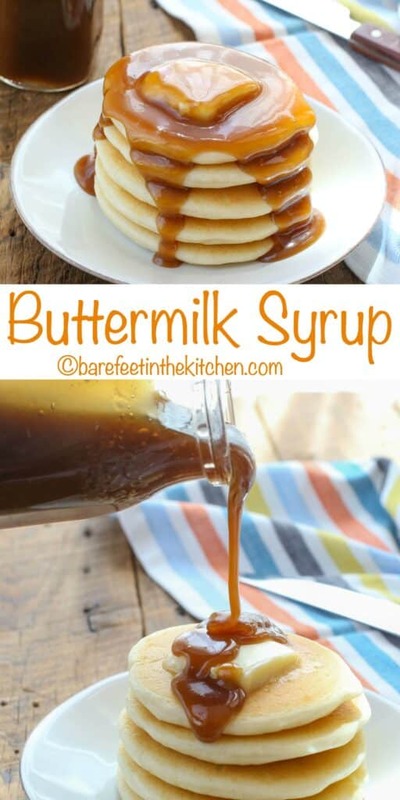 However, this combination of ingredients, as written below: buttermilk, brown sugar, butter, vanilla, and baking soda results in a sweet, rich, and slightly creamy syrup that is plate-licking good. The syrup will foam and become quite thick and frothy the longer it simmers. If you prefer it without the foam, remove from the heat as soon as it thickens before it has a chance to foam or make it ahead of time and allow it to settle before serving. For what it’s worth, we like the foam and it doesn’t bother us a bit. If there’s a homemade syrup to try, I want to be first in line to try it. Do you have a recipe for a homemade syrup that I should try? Please send it to me! 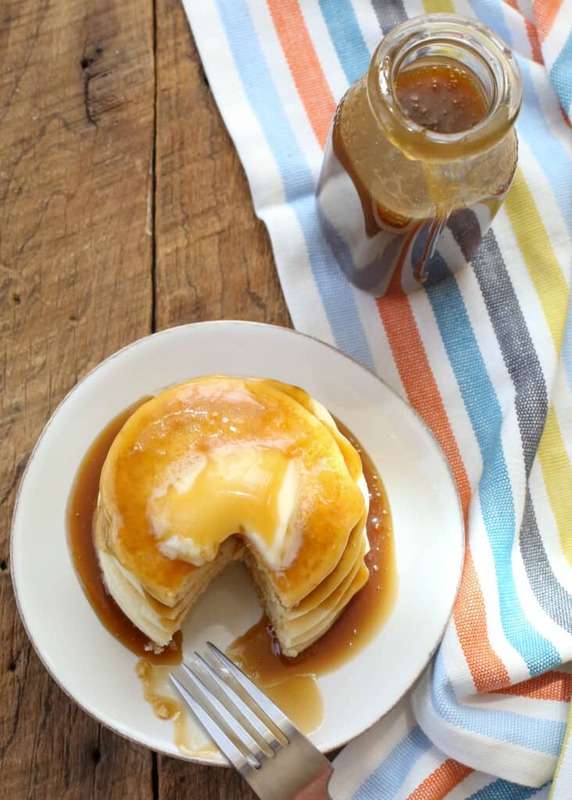 If you haven’t tried my grandmother’s waffle sauce or Rebecca’s brown sugar syrup, you need to put those on your list to try immediately after this one. As much as I love a simple dark maple syrup, there’s something extra special about a homemade syrup or sauce. Try Buttermilk Syrup with these Banana Coconut Pecan Pancakes, Light Fluffy Whole Wheat Pancakes, Light Fluffy Gluten Free Pancakes, or these Mini German Pancakes. 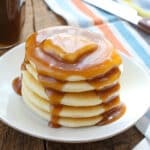 These Sheet Pan Pancakes from BellyFull and these Brown Sugar Oatmeal Pancakes from Your Homebased Mom would both be fantastic with buttermilk syrup as well. Combine the brown sugar and buttermilk in a medium-size saucepan over high heat. Whisk or stir to combine and bring to a boil, stirring often. Reduce heat to low or medium-low and simmer for 3-4 minutes, stirring occasionally, until the sugar has dissolved and the syrup has thickened. Add the butter and stir to melt. Remove from the heat. Add the vanilla and baking soda. Whisk or stir well to combine. Let cool at least 10 minutes before serving. Store in an airtight container in the refrigerator. 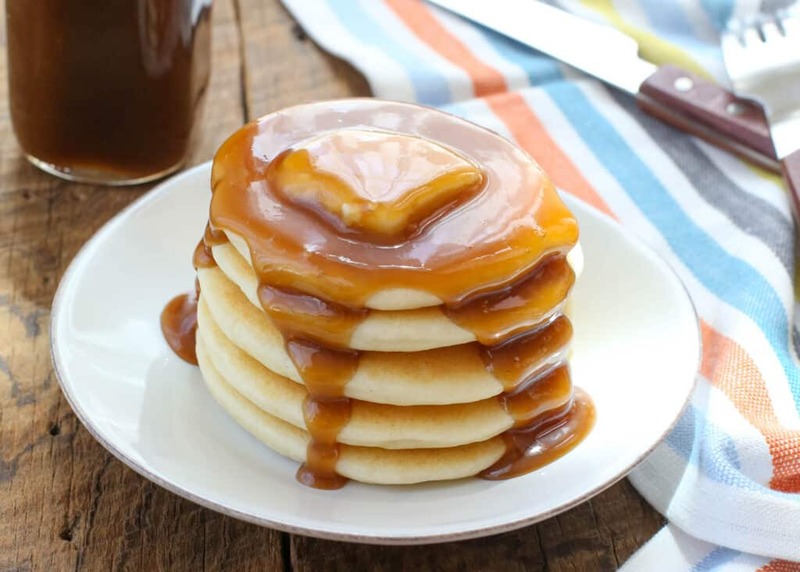 Buttermilk syrup is a rich and creamy sauce for all your favorite breakfast treats. Combine the brown sugar and buttermilk in a medium-size saucepan over high heat. Whisk or stir to combine and bring to a boil, stirring often. Reduce heat to low or medium-low and simmer for 3-4 minutes, stirring occasionally, until the sugar has dissolved and the syrup has thickened. Add the butter and stir to melt. Remove from the heat. Add the vanilla and baking soda. Whisk or stir well to combine. Let cool at least 10 minutes before serving. Store in an airtight container in the refrigerator. Enjoy! The syrup will foam and become quite thick and frothy the longer it simmers. If you prefer it without the foam, remove from the heat as soon as it thickens before it has a chance to foam or make it ahead of time and allow it to settle before serving. For what it's worth, we like the foam and it doesn't bother us a bit. That looks so good! I've never heard of it! Reminds me of cajeta, although that's made from goat's milk, so it of course wouldn't have the same flavor, but it has the same look. Thanks! Have you tried this with buttermilk made by adding vinegar (or lemon juice) to milk? Does it work the same? The syrup does work when made with a buttermilk substitute, however, you won't have the same depth of flavor. Even though I typically use a substitute buttermilk 95% of the time with my baking, I buy regular buttermilk at the store for this recipe. At least a week, probably longer, although ours has never lasted that long to see. We make ours with white sugar. It is cream colored and it makes it not quite as rich. We like it on German pancakes.